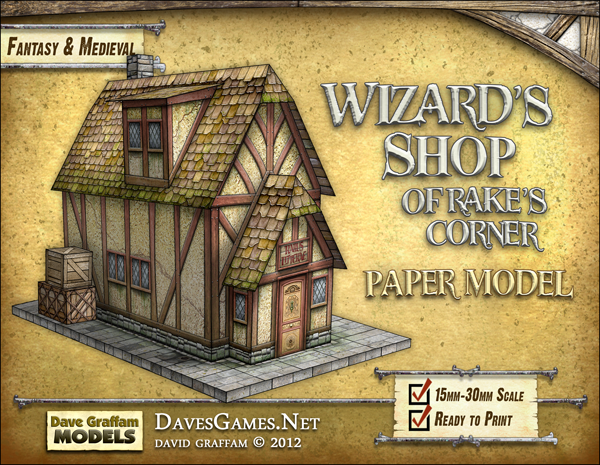 Wizard's Shop of Rake's Corner released! The Wizard's Shop is now available! This is my latest Rake's Corner release, a ready-to-print model with a shape that might be familiar but all-new textures to make it something unique. This model has half-hipped roofs (a new feature for me) and 2 crates. As a bonus, the PDF set includes a 15mm-scaled version that fits on one page. The PSD Photoshop files pack is also available so you can get creative!